Monster Jam – What a Thrill! Monster Jam - What a Thrill! So, have you heard of Monster Jam? Well, I hadn’t heard of it until last year. SO, I got a group together and we went this year. And it was pretty thrilling – the roar of the motors, the amazing jumps, the crashes and the crowd excitement – left me wanting more. Best part? It was my first event at Lucas Oil Stadium. Man, that place is amazing! Check out my slide show. So, have you been? 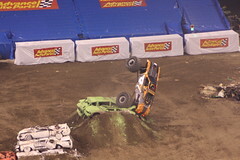 If not, there is always next year (end of January) or catch it somewhere else – Monster Jam.